Last night was Sunday, which made it Crappy Dinner Party night. Haven’t read about our weekly CDP? I recommend doing that right away, and then laying plans for your very own regular Crappy Dinner ASAP. It was my husband’s birthday this week, so we hosted. He wanted to grill burgers and dogs, which are super yummy and yes please to all of that. However, if you are trying to reduce your red meat consumption or are vegetarian or vegan, I find portobello burgers to be a really worthy substitution. (Recent studies seem to show a correlation between eating meat of any kind of your risk of Type 2 diabetes. Studies also show that eating meat raises your risk of cancer and heart disease. This is not to say you have to give up meat entirely, but rather substitute some of your meat choices for vegetarian choices instead. Click here for an explanation and some tips.) You still get the meaty texture when you bite down, and the mushrooms soak up any delicious marinades you throw their way. Top with sautéed onions, a slice of cheese, and pickles and I guarantee you will enjoy your experience! Here’s the marinade I use to make my portobello burgers. Mix all ingredients together and pour over the mushroom caps, turning every 15 minutes until time to cook, making sure to pour the mixture into the underside of the mushrooms before grilling. Throw on the grill and cook until desired doneness. If you’d rather put them in the oven, preheat to 425°, place mushrooms stem side down in a baking dish, and roast for 18-20 minutes. I have always struggled with my blood sugar. I am infamous in my family for getting, shall we say, cranky if my blood sugar dips. I regularly get a little lightheaded upon standing if it’s been too long since I last ate, and there have been times when I have gotten sweaty, shaky, and nauseated from waiting too long to eat. I always just thought that this was how I was built. I couldn’t understand it when people told me they regularly skipped meals. I couldn’t fathom how that was even possible. In my recent studies to become a Nutrition Consultant, I’ve been learning a lot about blood sugar irregularities, also knows as dysglycemia. Because of regular blood tests, I know that everything else is functioning normally, and so far my low blood sugar issues haven’t caused any damage. BUT, left unchecked, high or low blood sugar can lead to all kinds of problems. We all know diabetes is a huge problem in our country, and chronically high blood sugar can (and probably will) lead to a Type 2 Diabetes diagnosis somewhere down the line unless you get it under control. The good news is there is a lot we can do with our nutrition to help stabilize our blood sugar. Last week I started a concerted effort to make sure every single snack and meal contained a healthy fat (think nuts, avocado, fish, whole fat yogurt, olives, olive oil), a healthy carb (like those found in sweet potatoes, sprouted grain toast, or an apple), and high quality protein (again, nuts and fish and yogurt, but also chicken, legumes, a hard boiled egg, or hummus). Plus for each meal, lots of non-starchy veggies. I also have been giving myself a snack a couple hours after breakfast. I used to try to just hold out until lunch, but would find myself literally counting the minutes until 11:00 a.m. Ever since I’ve made these changes, It has made a HUGE difference in my hunger levels. It used to be that every afternoon between about 2 pm and dinner time, I would be ravenous. Normally that’s when I would inhale too many crackers because my blood sugar was low and simple carbs were what my body was begging for. But for the last week my blood sugar feels quite stable. I can wait until 12:00 or 1:00 for lunch now that I’m having a snack. And that period between lunch and dinner is no longer excruciating (because I’m nourishing my body with what it needs earlier in the day). I’ve been on vacation with family and have been so much more flexible in when we eat our meals because I’m not feeling like I might pass out if I don’t eat rightthisverysecond. I don’t know if my weight will change, and quite frankly I don’t care. I like the fact that I feel healthier, more flexible about my eating schedule, and less cranky. I’m sure my family will enjoy those benefits as well. So, if you feel like maintaining an equilibrium with your blood sugar is an issue, try this method. It takes a bit of planning, but it is worth it. And please check back in with me and let me know if it works for you! For healthy snacking ideas, click here. I wanted to check in with a quick nutritional tidbit for this week. 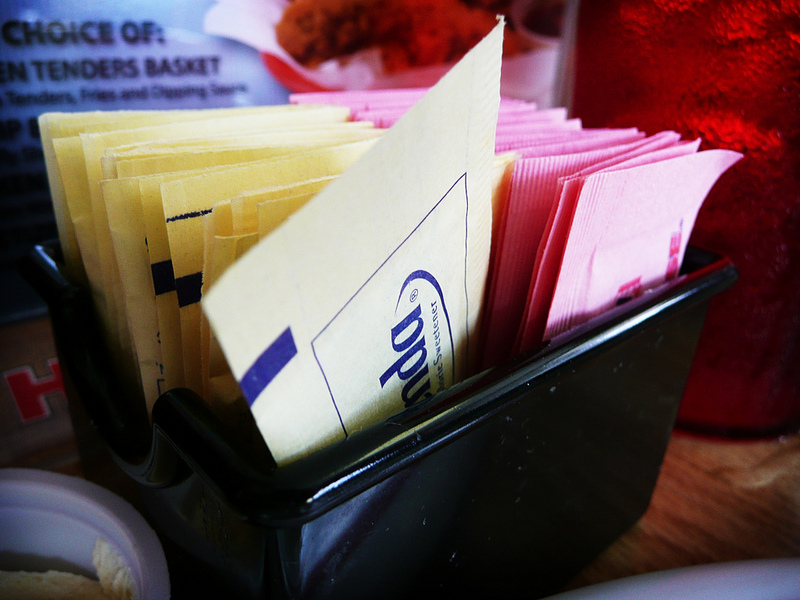 As you have probably read and heard thousands of times by now, artificial sweeteners aren’t good for us. We know this because the nutritional and wellness experts have said so. But do you really understand the *why* behind it? There are a few key reasons, and I will quickly outline them for you here. All non-caloric sweeteners, even Stevia, require commercial processing. Some use less toxic chemicals and some use organic processes. But, they all go through processing. If your goal is to eat as close to “natural” as possible, then a highly processed artificial sweetener probably doesn’t fit into your plan. Somehow, even with the prevalence of zero-calorie artificial sweetener consumption, the U.S. population has continued to gain weight and fall prey to Type 2 Diabetes. While researchers try to figure out the reasons why, some have started to wonder if consuming too much artificial sweeteners tampers with our gut microflora, which in turn makes us more susceptible to maladies like glucose intolerance (a precursor to diabetes). Studies have both proven and disproven this theory, so obviously a lot more research needs to be done. Read more about it here. FULL DISCLOSURE: I am a proponent on “moderation”. I am not perfect, nor do I try to be. I enjoy a Diet Coke from time to time because it makes me happy. Just the way I will eat a few gummy bears (or whatever) if I feel like it. If I am following the 80/20 rule of nutrition, then I let the rest go. Life, in my opinion, is to be enjoyed. If eating a completely organic, whole foods diet is what makes you happy, then go for it! But for me, I find having a little wiggle room works best. As always, I would love to hear what you have to say!